Thoughts on Education Policy: How Many Bad Teachers Are There? With all the discussion surrounding the need to fire "bad teachers" these days, I wish we could take a step back and examine how many teachers out there are truly worth firing. A working paper by Thomas Kane and colleagues sheds some light on the issue. In the paper, they investigate the validity of teacher observations conducted by outsiders and find them to be fairly strongly correlated with both teacher value-added scores and levels of teacher experience. This leads to the conclusion that the observations are fairly good measures of teacher effectiveness. 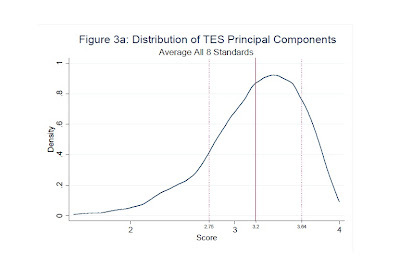 Included in the paper is this chart showing the spread of teachers who averaged ratings on a 1-4 scale. 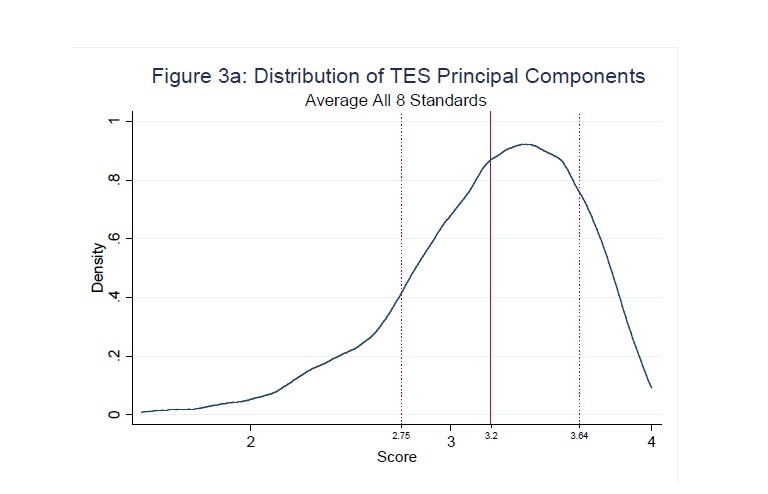 What sticks out to me is that the distribution is skewed far to the right -- well over half of the teachers earn at least a 3 on the scale, and there are only a few that score really low. This gibes with TNTP's report on San Francisco, in which fewer than 1% of teachers are rated unsatisfactory, and 94% of principals agree that teachers in their school who are underperforming are rated as such. In other words, maybe the vast majority of teachers are doing a pretty good job. Which, of course, is not to say that teachers who are failing their students should remain as is forever. Clearly, as in any profession, there are teachers who need to receive more training, work harder, and/or move to another job. But if this is the case (and I'm not going to claim it is based on only one study), then we should be a little more careful with our rhetoric. If most teachers are doing a pretty good job, then we should probably spend a little more time praising them, a little less time decrying the fate of the teaching profession, and refer to bad teachers as the exception rather than the rule. Corey: Well said. I also agree that most teachers are at the higher end of the scale and the public debate should veer away from denigrating educators. I also believe (from my experience as both a student and a teacher) that some, if not most, of the teachers rated as "less effective" would be much more effective if certain aspects of their teaching environment were changed. For example, a teacher who struggles to teach classes of below-grade level students mixed with mainstreamed special education kids might be great as an AP History teacher (or visa versa). Many teachers have little control over their course assignments (and even their school assignments in some districts) and should not be blamed if they are placed in a course or grade level outside their expertise. After teaching for 17 years, I would say that number is actually closer to 5%. But still, that is a very low number. On an average high school campus 100-150 teachers, this would mean 5-7 teachers are bad. It has also been my experience that they are often bad, because administrators do NOTHING to force them to improve. Administrators have two "solutions" for bad teachers. 1) Punish ALL of the faculty with new rules and policies due to the behavior of 1 or 2 teachers. 2) Send the bad teacher to "limbo" by giving them an assignment that no one wants, like freshmen Algebra I repeat students. They do this in the hopes that the bad teacher will leave on their own. Sure teachers who commit crimes or do inappropriate things with students are fired, but little is done to improve bad teachers. I'm not advocating they be fired. What they really need is training. Many teachers are bad because they simply have not been properly trained. Of course very few schools have any budget at all to help struggling teachers - and this is a pity, since most will keep struggling and be less than effective with the students in their care. We need to give administrators the tools to HELP poor teachers be better teachers and stop the BLAME GAME. You know what? You are in denial. Bad teachers are everywhere. These are your dog and pony show teachers. They know way ahead of time when they are going to get appraised/observed. This study does not prove anything. I am sure these teachers knew someone was coming to observe them and voila they are great again. What matters is how they are EVERYDAY, not one 45 minute period of some random day somewhere in time. Determining teacher effectiveness needs a major overhaul. I think you missed the whole these evaluations are "fairly strongly correlated with both teacher value-added scores and levels of teacher experience" part. It's certainly possible that some teachers are gaming the observations, but they happen to be the very same teachers whose students are progressing rapidly on standardized tests. So either these teachers are doing *something* the whole year or they're *really* good at raising test scores during the 1-5 periods per year they get evaluated when they actually try.